Foreign Affairs Undersecretary for Policy Erlinda F. Basilio turned over to the Pyongyang Kaeson Middle School a Philippine donation of Philippine and ASEAN books, as well as a computer set consisting of one desktop computer, one laptop computer, and one printer last July 1. Undersecretary Basilio was in Pyongyang with other Philippine officials to take part in scheduled Policy Consultations with the Foreign Ministry of the Democratic People’s Republic of Korea (DPRK). Established in August 1960 and located in Pyongyang’s Moranbong District, Pyongyang Kaeson Middle School was designated the Philippines-DPRK Friendship School on 23 August 2010, as part of the 10th anniversary of the establishment of diplomatic relations between the two countries. The school is run by nine officials and 79 teachers, and has a student population of 1,454. The donation was undertaken in cooperation with the Philippine Embassy in Beijing and the PH-Korea Friendship Society, based in Pyongyang. The Philippines and the DPRK established diplomatic relations on 12 July 2000. 1. The DPRK routiney names schools and farms as “Country X-DPRK Friendship school/farm”. For example, the Songyo Secondary School is also the “DPRK-Mongolia Friendship School”. I have written about “friendship farms” before (here and here). 2. The PH [Philippine]-Korea Friendship Society is an “organization” in the “TaeMun” (대문) portfolio. 대문 is the North Korean abbreviation for 대외문화련락위원회, or in English, the Committee for Cultural Relations with Foreign Countries. I say “organization” because in reality this friendship society, like all of the others, contains only one or two part-time members. TaeMun takes its origins from an imported Soviet office named the All Union Society for Cultural Relations with Foreign Countries (Всесоюзное общество культурных связей с заграницей), known in the West by the acronym VOKS (from the Russian “BOKC”). Historically, its job was to create sympathetic constituencies in foreign countries and provide the North Korean government with an alternate channel of foreign information, but since the Arduous March they have transformed their mission to focus more directly on resource acquisition. There is some tension between TaeMun and the DPRK Foreign Ministry. TaeMun has a web page here. 3. Here are some previous posts on the DPRK-Philippines relationship: here, here, here and here. UPDATE (1/14/2011): More form Martyn Williams here. South Korea has blocked its people in the South from accessing Web sites using North Korea’s national Web domain name, saying the sites contain “illegal information” under the nation’s anti-communism and security laws, officials said Thursday. The blockage by the South’s state-run Communications Standards Commission came less than a day after an expert said North Korea had renewed the use of its own national Web domain name of “.kp” in an apparent effort to widen public access to its propaganda sites. The commission started blocking Web sites using the “.kp” domain from Internet users in the South attempting to view those sites, including an Internet portal with an address of http://www.naenara.com.kp, officials said. Earlier in the day, Martyn Williams of IT research group IDG said in an e-mail that he found http://www.naenara.com.kp operating over the weekend while http://www.friend.com.kp and http://www.star.edu.kp likely came into use at about the same time. All of the sites use “.kp” — assigned to North Korea — as their final domain names. “It was assigned in 2007 and managed by a company based in Germany, but the domain and a handful of sites also managed by the company disappeared in the second half of last year for reasons that are still unclear,” he wrote in his online article. The re-emergence of the domain name represents “a step-up in the country’s Internet presence,” Williams said. The sites have separate addresses to allow Internet users to access them. According to Williams, the sites, which include one that represents the North’s official Korean Central News Agency (KCNA), all have their servers based in the communist country. In the e-mail, the Tokyo-based technology expert said the main record for all the .kp names was updated on Jan. 3. “So that’s the earliest any of these sites could have reappeared,” he said. In recent months, North Korea has opened accounts at world-famous sites such as Twitter, YouTube and Facebook, drawing wide public attention. But the one on Facebook no longer operates while its Twitter and YouTube accounts were apparently hacked last weekend. Naenara at http://www.naenara.com.kp is a multilingual portal site, and http://www.friend.com.kp is mainly an English Web site run by an organ that handles exchanges with other countries. The KCNA has its Web site at http://www.star.edu.kp. South Korea bans its citizens from accessing pro-North Korea propaganda sites, citing the technical state of war it has been in with Pyongyang since the 1950-53 Korean War ended in a truce. UPDATE (1/9/2011): The Naenara URL came back online this weekend. The IP address http://175.45.176.14 has been replaced by the more memorable http://www.naenara.com.kp, though the IP address still works. The Naenara mirror site, kcckp.net, apparently did not survive the transition. Content from 2008 to the present is available, but all the content from 2005-2007 remains off-line and probably will not return. ORIGINAL POST (Oct 28, 2010): North Korea’s premier web outlet, Naenara, was frequently inactive in the month of August. Sometimes it was there, other times it was not. The web portal was up for one day in September under a slightly different URL. It has not appeared at all under its original URLs in October. Today, Martyn Williams, who broke the story on the DPRK’s acquisition of a block of IP addresses, reports that Naenara has been migrated to the new DPRK addresses alongside the newly created KCNA web page. The IP address Martyn mentions is for the English version. I will go through the new site to see if it is different in any way. One obvious difference is that the archived materials from 2005 & 2007 are gone. The Chosun Sinbo, which usually conveys Pyongyang’s views, described the housing construction as an “unprecedented national project” and a “core project” in the country’s campaign looking to 2012. The paper reported that the North was in the process of building 65,000 new houses in the city’s western district of Mangyeongdae, where Kim Il-sung’s birth home is located, 15,000 houses in central Pyongyang and 20,000 houses along the railroad spanning between the southern district of Ryokpo and Ryongsong district in the capital’s northern region. Each home will be approximately 100 square meters in size, according to the report. The North Korean capital, despite a strict control on the entry of people from rural areas, has reportedly been going through a major housing shortage. The paper said that the completion of the housing project will solve the problem plaguing the citizens of Pyongyang. In the past, Pyongyang has built 50,000 new apartments each in the 1980s and the 1990s. 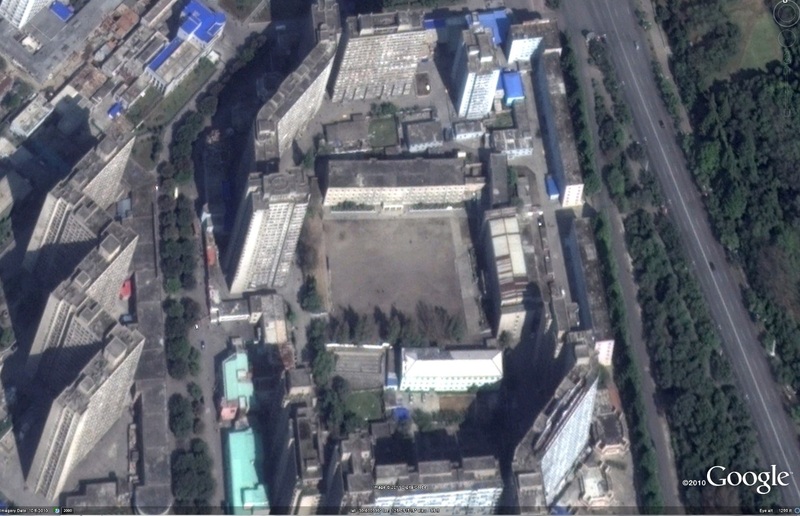 In 2001, North Korea sought to develop a satellite city of some 1 million households near the Mangyeongdae district, but failed due to the nation’s economic woes. You can read additional DPRK real estate posts here. Except for the monuments glorifying leader Kim Jong Il and his father, Kim Il Sung, the founder of North Korea, hardly anything new has gone up in decades. By night, the city is so quiet you can hear a baby crying from far across the Taedong River, which cuts through the center of town. Yet these days, high-rise apartments in shades of pink are taking shape near the Pueblo, the American spy ship captured in 1968 and still anchored in the river. A tangle of construction cranes juts into the skyline near Pothong Gate, a re-creation of the old city wall. About 100,000 units are to be built over the next four years. A modernistic silver-sided box of a conference center is already complete. Theaters and hotels are being renovated. Streets have been repaved and buildings repainted. Even North Korea’s most notorious clunker, an unfinished 105-story hotel that looms vacant over the city, is under construction again after sitting idle for nearly two decades. 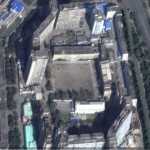 All are slated for completion by 2012, the 100th anniversary of the birth of Kim Il Sung. The deadline appears to have taken on new urgency for the appearance-conscious North Koreans, who fret that their capital has become a laughingstock. “We know we need to modernize. We want to make the city comfortable for the people who live here and for tourists,” said Choe Jong Hun, an official with the Committee for Cultural Relations With Foreign Countries. North Korean officials insist that they’re funding the building spree on their own, in keeping with an underlying ideology that emphasizes self-reliance. “If we rely on others, our dreams won’t be realized by 2012. It is all built with our own technology, our own material, our own labor, our own strength,” Choe said. But analysts are skeptical of such claims, given the nation’s economy and the regime’s secretive nature and often deceptive pronouncements. Expatriate businesspeople in Pyongyang say Kim might also be investing some of his own stash with an eye toward maintaining the loyalty of his Workers’ Party cadres. Apartments under construction look to be aimed at the elite. [The] Korean Friendship Association concluded its first busines [sic] delegation, headed by Mr. Alejandro Cao de Benos, Special Delegate and KFA President, in collaboration with the DPRK Committee for Cultural Relations, Ministry of Trade and the DPRK Chamber of Commerce. The group included companies from Australia, France, Spain and Lebanon in different sectors like ship building, foodstuff production, medicine, IT and infrastructure, etc. The visit was a big success and 75% of the investors signed letter of intentions and contracts. All of the participants agreed that DPR Korea has a huge potential and new market with many interesting opportunities with the lowest taxes and wages but with the most skilled, motivated workforce. The companies fullfiled [sic] all their plans and resolved the questions during the visit and they had meetings with their Korean counterparts as well as with the officials of Trade, Chamber of Commerce, Banking authorities and logistics. They visited a Foodstuff factory, Heavy Machinery complex, Ostrich farm as well as the ‘Kaesong Industrial Zone’ in the border with South Korea, were they had a briefing by the Director representative of Hyundai-ASAN. After that, the investors visited a South Korean cable-making factory and a garment manufacturing plant specialized in high quality sport brands. From KFA we congratulate the companies that concluded agreements and established Joint Ventures in the DPRK and wish them success in their projects. From a follow up post on the KFA forum, one of the attendees appears to be Mr. Kevin Liu, head of Asian Division of London-based Exclusive Analysis. The international press (and just about every blogger on the planet-including myself) has written something about the NY Philharmonic’s visit to North Korea last week. Whether one believes that this event is a significant breakthrough in cultural relations or not, what has evaded direct discussion in the media is the purpose of cultural relations in the North Korean system (and indeed its predecessor – the Soviet system). At the end of World War II, the DPRK imported many Soviet party, state, and military organizations. One of these was the USSR All Union Society for Cultural Relations with Foreign Countries (known as ‘VOKS’). Publicly, the mission of VOKS was to promote peace and understanding between the Soviet people and other peoples of the world. However, the actual mission of VOKS was to promote Soviet ideology, policy, and influence overseas. VOKS began its mission in the 1920s. It undertook activities such as: Attempting to influence French intellectual circles; bringing sympathetic individuals and groups to tour the Soviet Union to see how the construction of the worker’s paradise was proceeding; bringing students from the developing world to be educated in the Soviet Union; sending Soviet scholars and technicians to undertake development projects overseas, etc. VOKS was even influential in the USA, where it supported a number of pro-Soviet civil society organizations. VOKS also played an important role in establishing the legitimacy of Soviet hegemony in North Korea following World War II. Cultural delegations of North Koreans were taken to the Soviet Union to bear witness to the great accomplishments of the worker’s revolution. Their impressions were then distributed to the North Korean population at large, along with many other cultural goods produced by the Soviet Union. Although VOKS’ success at swaying public opinion in the west is an unresolved question (as far as I know), the details of their activities are well known to western scholars since Soviet archive materials are readily accessible. Effective or not, the take away from this history lesson is that socialist countries have historically treated cultural relations activities, like everything else, as regime-enhancing activities. In other words, they promote the political incumbents. The North Koreans copied VOKS wholesale from the Soviets, and this organization is still functioning in the DPRK today. It is the Korean Committee for Cultural Relations with Foreign Countries (CCRFC). Although this body has been around since the founding of the DPRK, it is perhaps most known in contemporary times for supporting the Korean Friendship Association, numerous pro-Pyongyang “Friendship Societies,” and to a lesser degree, several leftist organizations such as the National Lawyers Guild. These organizations tend to toe the party line and echo Pyongyang’s perspective in international debates. At a minimum, they promote a marginal distrust of western media and historiography. Based on the comments I have made so far, many might be led to believe that I am pessimistic on the positive impact that cultural relations broadly, and the the NY Philharmonic visit specifically, might have in changing the North Korean system. But this would be a mistake. Since the Arduous March and Kim Jong Il’s rise to power, North Korean institutions have undergone such a transformation that comparison with their Soviet predecessors might not be useful for understanding their purposes today. Since 1997, the North Korean CCRFC has been chaired by Mun Jae Chol, a North Korean policy elite. I just finished watching the NY Phil performance-here-and Mun Jae Chol is indeed in the audience, as are several people who work for him who I have met. Mun Jae Chol took over the committee in 1997 (as best I can put together from KCNA reports–his promotion was not formally announced in the news), and since then the mission of the organization seems to have changed significantly. To start with, the cold war is over. North Korean cultural relations activities are not going to convince the world’s people that the North Korean government is the legitimate governing authority for the whole Korean peninsula. No one will ever believe that now. Since the propaganda war is over, and resources are scarce, the CCRFC seems to be focused on generating foreign exchange revenue from tourism, cultural exchanges, and brokering foreign direct investment (all under the guise of their previous mission, however). Under established laws and customs, the staff of the CCRFC are permitted to interact with foreigners and make regular trips overseas. They are the very people who have an incentive to promote interaction with the west because they will directly benefit financially from it. True these people are not paragons of liberalism, but they all own western clothes, use digital cameras, listen to iPods, broker deals between private North Koreans and foreigners (smuggle goods), and travel to China on a regular basis. There are procedures in place to control their entrepreneurial tendencies, such as never allowing one guide to be alone with a foreigner, however, these rules can be evaded at minimal cost. They might repeat what they are told to say, but they certainly know better. Staff of the CCRFC include influential party members and security personnel. Raising the frequency and profile of cultural relations activities with North Korea will increase the income of these individuals who can buy support directly through cash transfers, or indirectly through business deals, ultimately greasing the cogs of change in the North Korean bureaucracy towards a greater acceptance of openness. Maybe. CCRFC (known in North Korea as Taewe Munhwa Ryeollak Wiwonhoe or simply TaeMun) is indeed struggling to survive in the changing economic environment. Although most of the projects they try to lure foreigners into are devoid of economic sense, they are still pretty powerful and even allowed to invite journalists to visit N.Korea. Cooperation with CCRFC is a game of unpredictability but in some cases can lead to success. See a success story here. The DPRK Chamber of Commerce was inaugurated on August 25, 2004 with the purpose of developing economic and trade relations with different countries over the world. The Pyongyang Chamber of Commerce (PCC), the predecessor of the DPRK Chamber of Commerce, had been established on March 1, 2000 and granted an associate membership of the International Chamber of Commerce (ICC) at its 33rd World Congress held in Budapest, Hungary in May, 2000. The PCC had conducted such service activities as trade, finance, arbitration and consultation helpful to the domestic and foreign trade and economic organizations in close relations with the ICC, national chambers of commerce and world trade and economic centres. It was registered in the directory of addresses published by the ICC, the International Trade Centre and other international economic organizations. With a view to expanding exchange and cooperation with foreign countries in all fields of the economy, the PCC was developed into the Chamber of Commerce of the Democratic People’s Republic of Korea. At present, it is extensively carrying on its commercial business in closer ties with the ICC and national chambers of commerce around the world. The DPRK Chamber of Commerce makes efforts to promote bilateral and multinational exchange and investment with Korean joint venture and individual enterprises in foreign countries as its full members and with foreign individual enterprises and entrepreneurs residing in Korea, overseas compatriots and foreign enterprises who hope to have business transactions with Korean partners as its associate members. It has an organizational structure consisting of secretariat, trade information committee, trade arbitration committee and exhibition committee as well as non-permanent credentials committee for full members or associate members. The trade information committee engages in such business as collection and distribution of information data on world economy and trade, international commodity and financial markets. The trade arbitration committee handles correct examination and settlement of disputes relating to economy and trade. The exhibition committee organizes the opening of national trade fairs at home and abroad and provides every convenience for the participation of its members in the fairs. The DPRK Chamber of Commerce will make a positive contribution to the promotion of foreign trade, invitation of investment and economic exchange with other countries. The DPRK Chamber is headed by Ri Hak Gwon. I have been unnable to determine any other posts he might have held in the past. “It is a great honour and a token of both appreciation and trust” , said Mr. Kim Myeong-ho, Deputy Director of the Department of International Relations of the Korean Workers’ Party welcoming two representatives of the Friedrich Naumann Foundation at the Headquarters of the Korean Workers’ Party (KWP) in Pyongyang. Since their meeting at the beginning of February this year the international political situation has changed dramatically: the February 13 Agreement on the Denuclearisation of the Korean peninsula was signed between the six parties DPR Korea, USA, China, Republic of Korea, Japan and Russia. Meanwhile, the parties have taken necessary steps to ease the tensions on the Korean Peninsula and to move towards denuclearization. Both the U.S. and the DPR Korea have started negotiations on the normalisation of bilateral relations within the framework of the Six-Party Talks. Finally, both Koreas agreed to hold a second summit on 2-4 October. Mr. Kim Myeong-ho expressed his appreciation of the training activities of the Friedrich Naumann Foundation in the DPR Korea. Referring to the New Year’s editorial of the Rodong Shinmun, the KWP’s newspaper, he mentioned the priority of modernizing the economy in the sectors of agriculture, light industry, IT and banking. According to him, of particular interest are methods of farm management, renewable energy and food security but also city management. The representatives of the KWP accepted FNF’s offer of having a study tour to Germany for party officials in 2008 presuming further progress in the Six-Party Talks. The members of the delegation would have “fresh ideas” after being back in the DPR Korea, FNF was told. Walter Klitz, Resident Representative of the Friedrich Naumann Foundation in Korea, also had meetings with representatives of the Ministry of Foreign Affairs and the DPRK’s Chamber of Commerce. In cooperation with the European Union, FNF will hold the 3rd EU-DPRK Economic Workshop in October, its fourth seminar this year. Here is the agenda for a training seminr held last April. Here is their summary of the event. A major South Korean business organization said Thursday (Sept. 27) it plans to form a civilian body for economic cooperation with North Korea on the occasion of the 2007 South-North Korean Summit next week. The envisioned body, tentatively named the South-North Korean Economic Cooperation Forum, is to be set up in October and have 50 members, including 35 entrepreneurs, the Korea Chamber of Commerce and Industry (KCCI) said. It would be the first non-governmental channel for inter-Korean economic cooperation. Currently, the South’s Ministry of Unification and the North’s National Economic Cooperation Federation are the sole channels for inter-Korean economic cooperation. “The establishment of the body is designed to further promote inter-Korean economic cooperation on a civilian level,” said Kim Sang-yeol, vice chairman of the KCCI. The planned group will conduct economic cooperation projects with the North and help improve North Korea’s investment environment, the KCCI said. To that end, the chamber will try to sign a deal with its counterpart, the DPRK Chamber of Commerce, and send an investment inspection team to the North after the end of the summit. DPRK is the acronym for the North’s official name, the Democratic People’s Republic of Korea. Established in March 2000, the chamber of commerce, which includes members of 100 major companies, has carried out external economic exchanges and attracted foreign investment in the North, according to the KCCI. South Korean President Roh Moo-hyun is scheduled to meet North Korean leader Kim Jong-il from Oct. 2-4 in Pyongyang. Seoul has hinted that the promotion of economic cooperation will be high on the agenda of the 2007 South-North Korean summit, as it was in the first summit in 2000. In his own words: “[The KFA is] looking into development of new areas to expand into, especially those related to economy that are critical also for the development and life improvement of the DPRK. Since KFA has played an important role in building friendship, now we also can play our part in building business. For accomplishing this goal, I announce the creation of the IKBC (International Korea Business Center). As a sister organization of the KFA, the IKBC will strictly take care of business issues, facilitate business information to private investors and companies around the world. In close collaboration with the DPRK Chamber of Commerce, IKBC will become the reference link between the DPRK and foreign businessmen. The spirit is to build a DPRK Chamber of Commerce outside the DPRK that will approach the countless possibilities in trading that will benefit all sides involved. Alejandro’s involvement raises questions about the relationship between the DPRK’s cultural diplomatic efforts (since he is a client of the Committe for Cultural Relations with Foreign countries) and its business outreach efforts auspiciously under the Ministry of Foreign Trade. I suspect that various DPRK agencies have been blurring the boundries between the two activities for fiscal reasons. As access to hard currency comes to play a greater role in the DPRK system, I predict that we will see more of this kind of mission creep on the DPRK side. A delegation of the DPRK Chamber of Commerce (KCC) took part in the 5th China International Equipment Manufacturing Exposition on Aug. 29, 2006 and the 2nd China Jilin Northeast Asia Investment & Trade Exposition on Sep. 2, 2006. During its participation in the expositions, the delegation held an interview on investment and discussed matters of investment in the development of a vanadium mine, stone dressing, the production of agrochemicals and calcium carbonate, seafood breeding and processing and so on. The KCC secretary-general made an introductory speech entitled “On the trade and investment policy of the DPR Korea”. At the interview, a series of technical matters on joint ventures and processing trade as well as investment guaranty were discussed and agreed between traders. A trade and investment seminar for European businessmen was held in Pyongyang under the sponsorship of the KCC on October 30, 2006. There was the general explanation on the DPRK trade and investment policy and the investment environment. I was doing some research this weekend for a paper I am writing, when I stumbled on the following stories from KCNA. It seems that although President Clinton never made it to the DPRK before his term in office ended, his brother Roger Clinton (aka “US pop singer”) did. Pop singer Roger Clinton, brother of the U.S. president, and his party arrived here today to visit the DPRK on the invitation of the Korean Asia-Pacific Peace Committee. They were greeted at the airport by Ri Jong Hyok, vice chairman of the Korean Asia-Pacific Peace Committee, and Song Sok Hwan, vice-Minister of Culture. U.S. pop singer Roger Clinton and his party enjoyed a concert staged by the state symphony orchestra at the Moranbong Theatre Friday. Among the audience were Ri Jong Hyok, vice-chairman of the Korean Asia-Pacific Peace Committee, Song Sok Hwan, vice-Minister of Culture, officials concerned and working people in the city. The artistes of the state symphony orchestra staged the orchestral pieces “Arirang,” “Dear Home In My Native Place,” “Nostalgia,” “Bumper Harvest Has Visited Chongsan Field,” a piano concerto “Korea Is One,” and so on. U.S. pop singer Roger Clinton and his party visited Mangyongdae on December 3. They looked round historical relics with deep interest, hearing an explanation about how the President Kim Il Sung was born and spent his childhood there. They posed for a souvenir photo in front of the old home at Mangyongdae. They also visited the Tower of the Juche Idea, King Tangun’s Mausoleum and Pyongyang metro on the same day and the Mangyongdae Schoolchildren’s Palace on Saturday. Kim Yong Sun, chairman of the Korean Asia-Pacific Peace Committee, Saturday met and had a talk with U.S. pop singer Roger Clinton on a visit to the DPRK. Present there was Ri Jong Hyok, vice-chairman of the Korean Asia-Pacific Peace Committee. A performance was given by U.S. pop singer Roger Clinton at the Ponghwa Art Theatre yesterday. It was seen by Kim Yong Sun, chairman of the Korean Asia-Pacific Peace Committee, Ri Jong Hyok, vice-chairman of the committee, Mun Jae Chol, acting chairman of the Korean Society for Cultural Relations with Foreign Countries, Song Sok Hwan, vice-Minister of Culture, and artistes and Pyongyangites. Roger Clinton and his party and Korean artistes took part in the performance. Roger Clinton presented solo pieces and his party song, dance and male and female solos. Korean artistes staged female concert, soprano, solo and dance and other pieces. Kim Yong Nam, President of the presidium of the Supreme People’s Assembly of the DPRK, met and had a talk with U.S. pop singer Roger Clinton and his party at the Mansudae Assembly Hall today. Roger Clinton said that it was an honor for him to visit Korea, expressing the belief that the visit would contribute to the improvement of the relations between the two countries. General Secretary Kim Jong Il received a gift from U.S. pop singer Roger Clinton on a visit to Korea. He handed it to Kim Yong Sun, chairman of the Korean Asia-Pacific Peace Committee. The Korean Asia-Pacific Peace Committee (KAPPC) gave a reception for U.S. pop-singer Roger Clinton and his party on a visit to the DPRK at the Mokran House on Monday evening. Present there were chairman Kim Yong Sun and vice-chairman Ri Jong Hyok of the KAPPC, vice-Minister of Culture Song Sok Hwan and other officials concerned. Vice-chairman Ri Jong Hyok in his speech said Roger Clinton has staged music and conducted social activities, adding that he is well known among the pop-music circles for presenting many lively and optimistic songs in different countries and regions of the world. Noting that Roger Clinton and his party gave a successful performance in Pyongyang, he hoped that they would find their stay in Korea pleasant and joyful. Roger Clinton in his speech expressed thanks to General Secretary Kim Jong Il and the KAPPC and the Korean people for providing him with an opportunity to visit the DPRK and give a performance. He said the performance tour this time offered an important occasion, adding that all of them should make positive efforts for peace in the future, too. An art performance was given during the reception. American pop singer Roger Clinton was interviewed by KCNA at Pyongyang Airport before his departure from here Wednesday. Giving his impressions of Pyongyang, he said it looked very positive and very much peaceful. From the artistic viewpoint, the talented Koreans that I saw here can perform any art of the world. They are as talented people as I have ever seen. But more specific is that children here are the most talented children that I have ever seen. They performed music and dance, just general art work. Really, the children are brilliant. If there is something that I like to say to the Koreans freely, one must claim, I’ll be back. I promise to convey all of my feelings, all of my lessons and all the information I have got from brave people to our people and to my brother. At earlier press interviews he said that he was proud of having performed in Pyongyang, and this was great generosity that the Korean people and the government granted to him. He thanked Marshal Kim Jong Il for the generosity. He hoped that his visit would be helpful to the improvement of the U.S.-DPRK relations. U.S. pop singer Roger Clinton and his party left today after concluding their Korean visit at the invitation of the Korean Asia-Pacific Peace Committee (KAPPC). They were seen off at the airport by Ri Jong Hyok, vice-chairman of the KAPPC, and Song Sok Hwan, vice-Minister of Culture. Before their departure, they hosted a reception at Pyongyang Koryo Hotel Tuesday evening in connection with their Korea visit. You are currently browsing the archives for the Committee for Cultural Relations with Foreign Countries category.